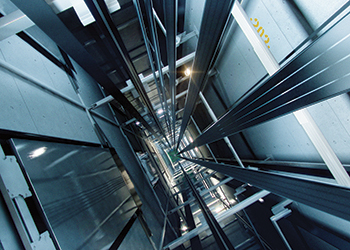 Kone UltraRope in an elevator-shaft. The global leader in the elevator and escalator industry arrived at the construction site of the tower in Jeddah last year in January, and will install a total of 65 elevators and escalators including 21 MonoSpace elevators, 29 MiniSpace elevators, seven DoubleDeck MiniSpace elevators and eight TravelMaster 110 escalators. 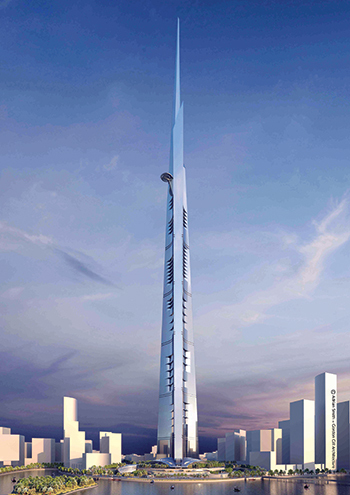 It will feature the world’s fastest double-deck elevators with a travel speed exceeding 10 m per second which will be equipped with the revolutionary Kone UltraRope hoisting technology, allowing the world’s highest elevator rise at 660 m.
To complement the building’s exclusive look, Kone will provide the Jeddah Tower with tailor-designed car interiors and landing doors as well as the latest People Flow Intelligence solutions including Kone Destination Control Systems and premium Kone Infoscreen displays. Other special solutions include Kone E-Link remote monitoring systems, as well as an occupant evacuation operation system for emergency situations. Jeddah Tower ... kilometre high. In terms of work progress, Halaseh tells Gulf Construction that pre-installation works are ongoing and are keeping pace with the structural core. Meanwhile, manufacturing is under way and Kone is now waiting for the contractor to release shafts at the Jeddah Tower so it can commence installations. Manufacturing the entire lift fleet will continue until just before completion, when the spire workman’s lift will be installed. The installation of the guiderails is expected to begin this month (May) when the lift installation works commence. He adds the final escalators will likely be installed in the last six months prior to project completion. There will be a number of finish materials that form part of the escalator construction sequence that will require this late installation. He says there have been no design changes, but a number of alternative lift-stop locations are being developed and considered in line with hotel fit-out design requirements. “The philosophy is to minimise any changes that could impact the completion date,” Halaseh points out. And although there have been no significant changes in specification, the changes and adaption of some EN 81 standards is a slight change to the original specification – which has been agreed with the design consultants, Halaseh says.